Coastal land-based human dispersal account for 80% of ocean plastic pollution, globally. Over 6.5 million tons of litter enter the world’s Ocean each year. 50% is long-lasting plastic that will drift for hundreds of years before it is degraded. Over 220 million tons of plastic are produced each year. We must choose to reduce our need and habits surrounding plastic use, especially single use plastic. We now have many alternatives that biodegrade safely. Plastics are serving a needed function, yet appropriate disposal is often not addressed. Some plastics have toxic components and the recycling techniques have not kept up with new plastic production. More than 5 trillion pieces of plastic, weighing nearly 269,000 tons, are littering the world's oceans according to a study by the scientific journal PLOS One. The study is the first of its kind to gather data from around the world on floating plastic. Several EU countries recycle 60-70% of used plastics and recover over 80% through integrated waste and resource management. We are currently recycling 90% of the ocean marine plastics and debris we recover on our expeditions, keeping much of it out of landfills. 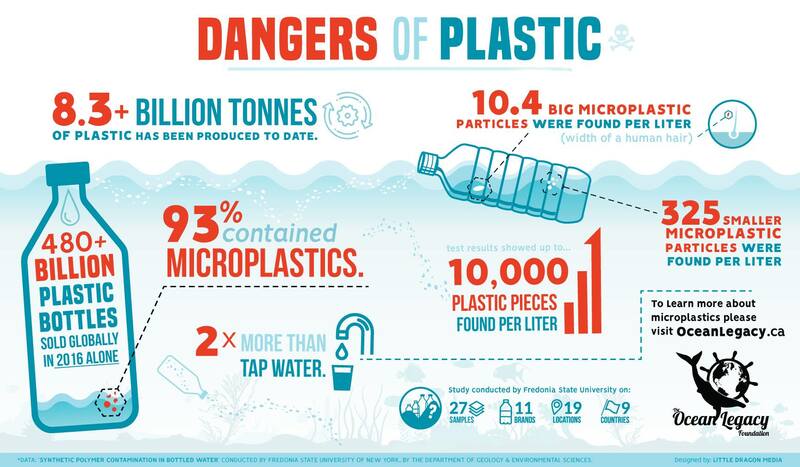 Small weathered micro-plastics, are now found within digestive systems of sea life, birds and mammals globally. They are also found in our seafood, our commercial beers, wines and bottled waters! More than a million seabirds and over 100,000 marine mammals die every year from plastic. Every day, more and more marine creatures are dying and washing ashore full of plastic and trash. Plastic and debris is concentrated in 5 areas called gyres as a result of oceanic currents, which continue to grow as they are constantly replenished with new plastic and marine debris. The North Pacific Gyre's great pacific garbage patch is twice the size of Texas and a rapidly growing monstrosity on our planet. A change in perceptions, could help change our strategies around plastic use and "disposal". For example, the marine debris we collect is being transformed into packaging, products, art and a mixed oil fuel. Learn about how we can work together! The two oceans of the Northern Hemisphere contain 56% of all particles and 57% of the total weight. In the Southern Hemisphere the Indian Ocean appears to have a greater particle count and weight than the South Atlantic and South Pacific oceans combined. FROM "SAILING SEAS OF PLASTIC" VISUALIZING FIELD EXPEDITION DATA FROM 2007-2013. EACH DOT REPRESENTS 20KG, ESTIMATES ARE THAT THERE ARE OVER 13 MILLION DOTS. Watch these selected videos to give yourself a good overview of the plastic pollution problem we are facing. From user-generated hotspot mapping and cleanup expeditions to education and plastic to fuel conversion technology!